H. M. M'Carty (Muc) Unacc not found 1864 recruit--unassigned--no other information available. Hager, Simon P. K 19 Fayette Co., Wharton Sept 23, 1845 5-Jun-1928 Farmington PA not found Per ACWRD, birth date and burial location in Fayette Co, Bethel Church Cemetery, Wharton Twp; 1861 substitute? ; age 15 at enlistment. Hale, John M 33 not found Feb 22, 1865 substitute, deserted May 23, 1865,. Hall, Daniel A 35 1885 not found wounded at Weldon Railroad Aug, 19, 1864; all data from ACWRD. Hall, George W. K 20 24-May-1915 Allport PA not found ACWRD lists him as "Hail". March 4, 1865 substitute; mustered out with regiment July 24, 1865. Hall, John B 25 lab. Shenango, Pa. Wheatland PA March 3, 1835 1906 Wheatland PA not found Captured at Cold Harbor, 11 months in Andersonville Prison; buried Haywood Cemetery, Mercer Co.
Hamilton, Robert D 22 school teacher 1895 Seattle WA 5101382 X Robert Hamilton is mentioned in this web article as joining the 33rd US Colored Regt in SC. Suspect this is same Robert Hamilton as there are numerous other recognizable Roundheads in this same article. 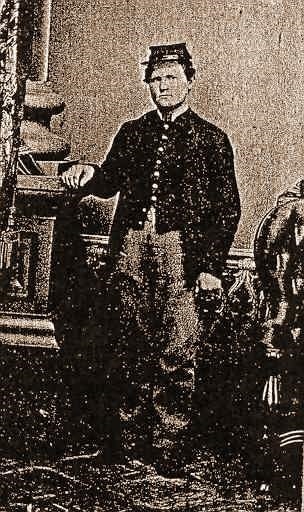 Per ACWRD, died in Seattle in 1895, post war photo contributor indicates his death was by suicide; was promoted to Captain of 33rd US Colored regiment in December of 1862. Findagrave info indicates death is 1894..very close match. 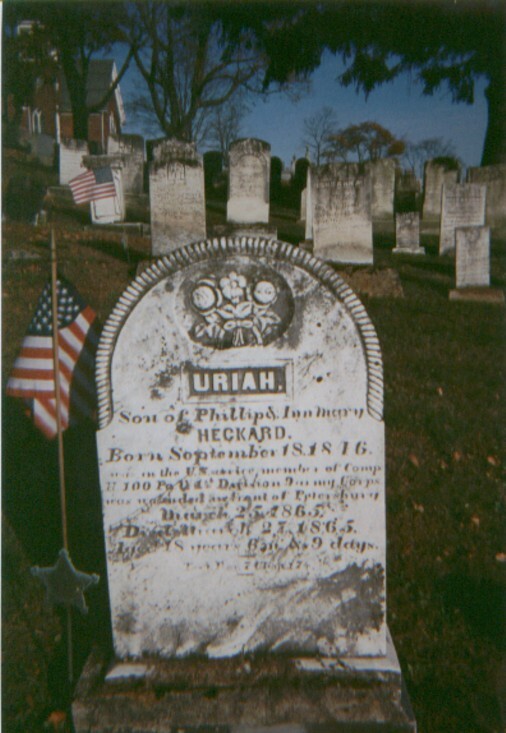 Hanen, John F 19 Not Found Per ACWRD, 1865 subtitute 3-2-1865, mustered out with regiment. Haney, John A 18 not found 1865 Substitute--wounded at Fort Stedman, 3-25-1865; data per ACWRD. 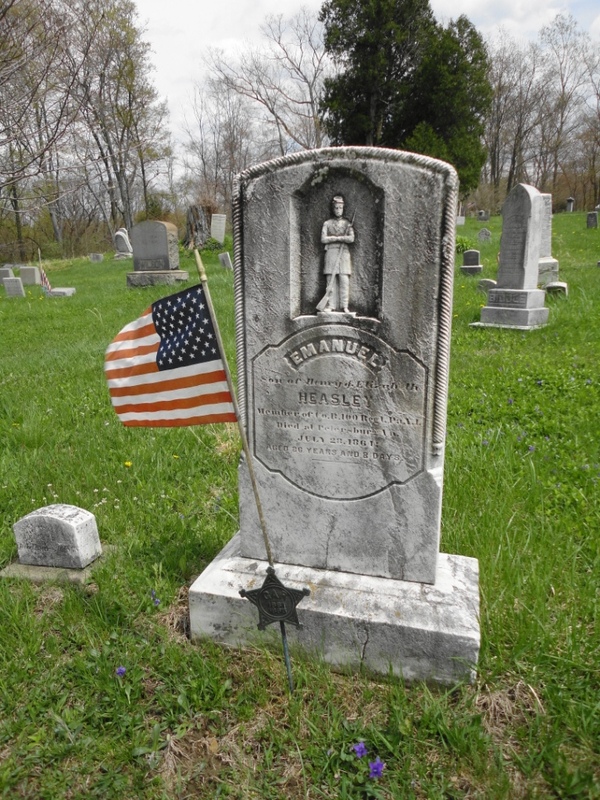 Hanna, Abraham E 19 dark 5' 5 1/2" brown brown farmer Plaingrove Twp, Lawrence Co. PA Sept 8, 1846 21-Oct-1914 Appanoose Co. IA X 28564741 X Per ACWRD, wounded at Spottsylvania CH, May 12, 1864; 1864 recruit. Hanna, Andrew D 44 laborer August 13, 1862 Potomac River--Drowned VA not found No other information found. Hanna, Thomas E 23 farmer Plaingrove, PA July 2, 1838 5-May-1912 Algona IA 24807351 Birth and death dates per ACWRD. Lived in Algona, IA after war per ACWRD. Findagrave info seems to be a match with ACWRD data. Hannah, John B. D 19 Beaver Co. Darlington PA 1843 10-Aug-1912 not found Per ACWRD, birthdate and burial location in Rocky Spring Cem., New Galilee, Beaver Co., PA; "Hanna". Haris, William M 39 not found Per ACWRD, substitute mustered in March 9,1865; deserted May 15, 1865. Harper, William H. B 21 Pulaski, Pa. 25-Jan-1911 Oil City, PA not found for Disability Nov. 30/62 S.C. of D.
Harpst, Daniel F 19 dark 5' 11" grey black farmer Mercer, Pa. 1842 2-Aug-1915 Richland Twp, Montcalm Co. MI 73697389 No other information found on ACWRD; no veteran info on findagrave listing. Harris, Lemuel A 21 Lawrence Co., New Castle PA Sharon, PA 11-Jul-1936 New Castle PA not found Loss of right foot; most data found in ACWRD. Harris, Samuel F. B 18 Pulaski, Pa. Pulaski PA July 6, 1843 9-Jan-1914 New Wilmington PA 16054225 X Per ACWRD, wounded at Wilderness 5-6-1864--after 14 days took him to Fredericksburg; also genealogy info. Hart, James A 38 1882 Washington Co. PA not found wounded at Fort Stedman, 3-25-1865 per ACWRD. Hartsein, Jacob A 38 April 5, 1862 Beaufort SC not found Only sick a day or two before death per ACWRD. Harvey, William F. D 21 light 5' 11" grey brown blacksmith Allegheny Co. Mansfield PA Penna. before 1890 not found 1890 census--widow Amelia H., per ACWRD 1864 recruit, no other info available. 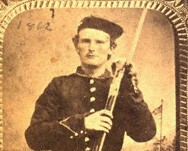 Haskins, Alex I 45 not found 1861 recruit; no further information found. 1/16/1863 from company I to company K ; findagrave info is possible based on same middle initial and death year but needs to be confirmed. Hatch, David C 18 fair 5' 4" grey brown farmer Crawford Co., PA Dec 17, 1845 20-May-1923 Victor CO not found Birth date and location per ACWRD. Hatch, John P. C 18 fair 5' 6" blue brown farmer 1846 May 3, 1895 Franklin PA X 25650441 Death date possibly May 30, 1895 per ACWRD. Hausen, Peter E 28 not found March 6, 1865 substitute, mustered out with regiment July 24, 1865. * POW (date and place not stated);Roll of Honor Information: Date of Death listed as 12/11/1864. Heckathorn, George W. E 20 April 4, 1844 5-Feb-1922 New Castle PA 60556789 lost leg at Hilton Head SC; per ACWRD, buried in Savannah Methodist Cemetery. 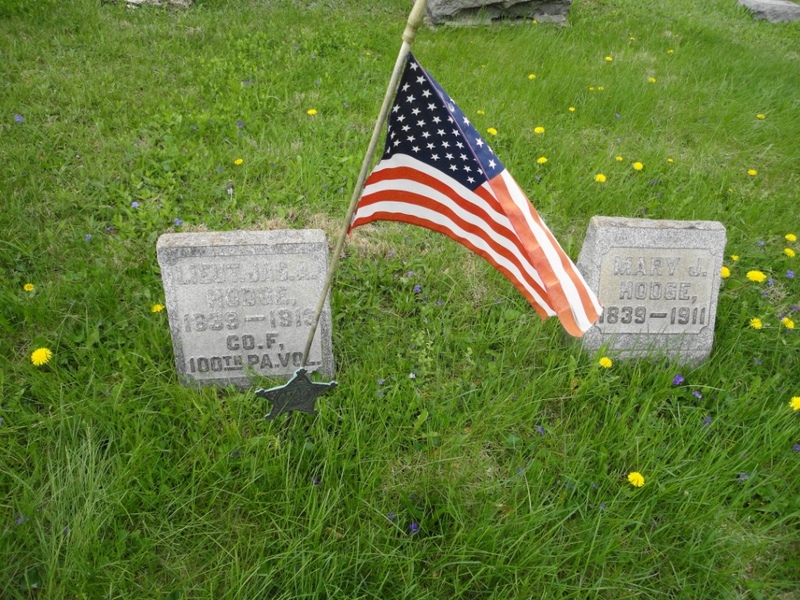 ; Shenango Twp, Lawrence Co., PA; supposedly the "last" man wounded in the regiment. Hennon, Joseph W. E 25 light 5' 6" grey dark Toeman Penna. January 7, 1836 September 16, 1862 Antietam Nat Cem MD X not found Died date unknown, Antietam Cem, grave 336, sec 26 lot c; per ACWRD died Septemberr 16, 1862 at Middletown, VA of wounds received at South Mountain, MD. 9-14-1862. Henry, Alexander M 43 Montgomery, Nat Military Home OH after 1890 not found No other information found. Henry, David D 35 dark 5' 9" dark black Ireland August 9, 1824 June 2, 1864 Cold Harbor VA X 9170347 Per ACWRD, killed defending a wagon train-shot through the head at Cold Harbor, VA 6-2-1864; also birth location and date info. Henry, Elias F 44 May 29, 1891 Hogestown PA X 75508674 Per ACWRD, 1865 draftee; possible death in 1890. Herron, William D 27 light 5' 9" grey sandy farmer Penna. April 19, 1865 Washington DC X 35073182 Per ACWRD, died of disease, buried in Arlington Nat Cem. Hindman, Joseph A. E 19 dark 5' 4" dark brown farmer Mercer Co, London PA Lawrence Co. PA Dec 25, 1847 26-Aug-1920 Grove City PA X 22099312 X Per ACWRD, birth information.buried in Woodland Cemetery, Mercer Co. PA; middle name "Alexander"; findagrave info has genealogy. Hines, George E 34 dark 6' 1" grey black Toeman Butler Co., PA Nov 7, 1897 Beaver Co. PA not found daughter "Ella" per ACWRD and death location. Buried in Beaver Co.
Hodge, James A. F 23 dark 5' 8 3/4" brown brown farmer Washington Twp., Pa. X Lawrence Co. Pulaski Twp. Dec 23, 1839 4-Jul-1913 Pulaski PA X 16054747 "Alex"; buried in Pulaski Cem, Lawrence Co. PA; gunshot wound in right shoulder; injury of back; grave lists him as Leiut. Hoff, Michael M 20 not found March 8, 1865 substitute--deserted May 15, 1865. 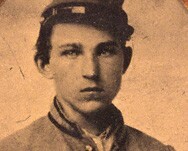 Hogan, Patrick Unacc not found December 23, 1863 recruit--unassigned per ACWRD. Hoge, James C 32 miller Lawrence Co., New Castle PA Butler Co. PA July 4, 1829 27-Jul-1906 Eastbrook PA not found "Hogue"; per ACWRD birth and death dates/locations; buried in Zion Baptist Cem, Worth Twp, Butler Co., PA; genealogy info listed; discharged 4-30-1863. Holland, John H 27 not found March 9, 1865 substitute-deserted May 18, 1865. Holliday, William I 21 Sept 10, 1863 Crab Orchard KY X 3288383 buried in Nat Cem (Lebanon, K; Section C grave 47; death date in ACWRD is listed as Sept 13, 1863. Hollinger, John D 28 Franklin Co. Welsh Run PA April 1, 1827 29-Jan-1911 Franklin Co., Welsh Run PA X 29371533 Struck with two shells on March 25, 1865--Fort Stedman based on 1890 census data; note: was older than pension card indicates, 38 not 28; substitute. Hollsbaugh, Jno. 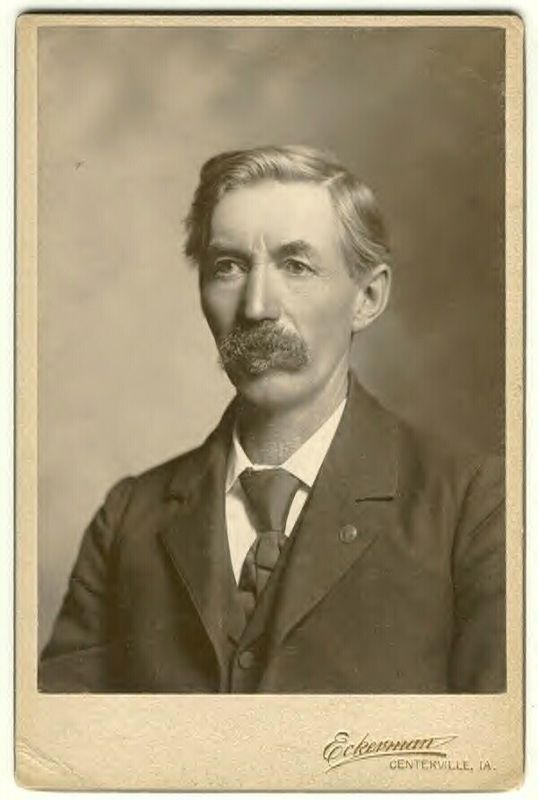 R. B 18 fair 5' 5" blue brown farmer Ritchland Co. Ohio Nov 17 1846 22-Mar-1901 Denver CO X 26853651 X Battle Days of the Roundheads Death date and location on pension card matches findagrave--1864 recruit also served with 2nd OH Heavy Artillery, Co. H as Corporal; "Holibaugh"; strange that gravestone has no mention of 100th PA! Holmes, Orange C 24 21-Jan-1920 Lockhaven PA not found 1865 Subsitute--no further record found. Holmes, Richard D C 23 Allegheny Co., Allegheny PA Pittsburgh, PA Feb 23, 1838 8-Apr-1911 Pittsburgh PA not found X Per ACWRD, promoted to Qtrmstr Sgt 11-13-1862 and Qtrmstr 3-14-1865; listed as being accidentally wounded in the face by a Thomas Willer; genealogy info and photo available; birth date and location..
Hoover, David I 27 Lawrence Co., New Castle 12-Mar-1912 New Castle PA X not found buried in Greenwood Cem. 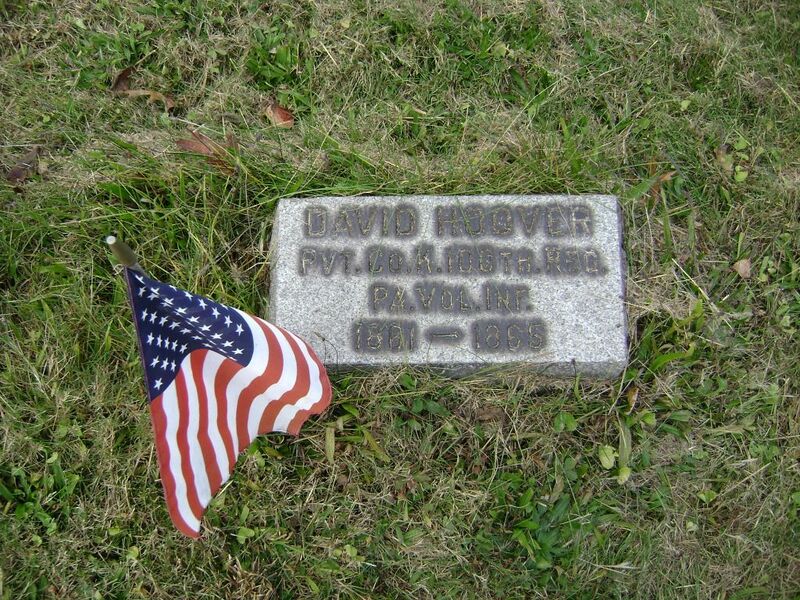 Hoover, David K 27 Lawrence Co., New Castle 12-Mar-1912 New Castle PA X not found buried in Greenwood Cem. 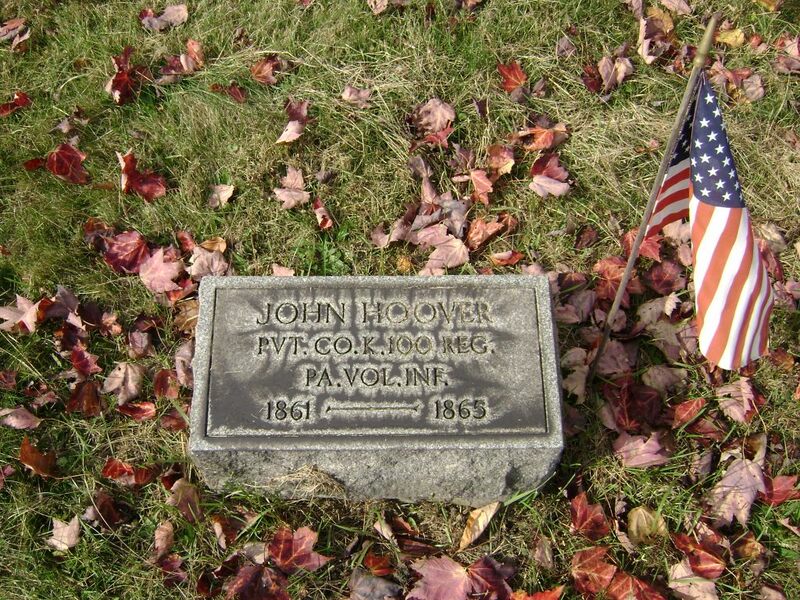 Hoover, John K 21 New Castle PA X 16049649 buried in Greenwood Cem. Hoovler, Edw'd H. G 21 Mercer Co., PA March 26, 1840 Sept. 3, 1891 Spragueville, Jackson Co IA X 12758790 X Family Plot--Union Center Cemetery, Maquoketa, IA buried in Union Center Cem. Hope, John C. B 18 Sharon PA March 7, 1876 New Wilmington PA not found Exp. Of service, buried in Neshannock Cemetery, widow Amanda M.
Hornbaker, Jno. 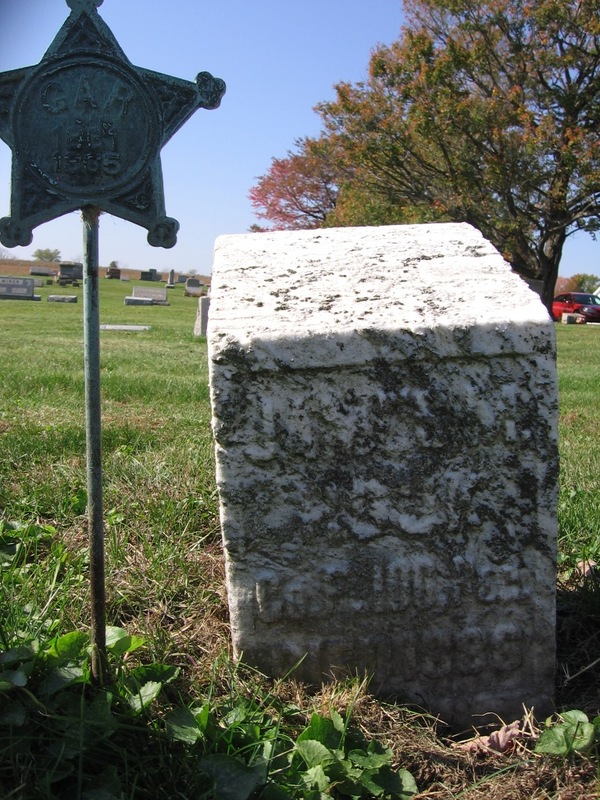 H. D 37 Franklin Co. Montgomery PA Feb 20, 1828 28-Feb-1902 Mercersburg, Franklin Co. PA X 41119308 1865 Draftee. Houk, James M. F 44 light 6' grey light carpenter Eastbrook, Pa. Beaver Co. PA July 22, 1822 Aug 29, 1886 New Castle, Lawrence Co. PA X 64009892 buried in Neshannock Cem, Hickory Twp, Lawrence Co. pA; same individual as James Houk; detailed in ambulance corps and re-enlisted in 1864. Housman, Isaac M 27 Aug 11, 1895 not found 1861 recruit; no further information found. Housman, Isaiah M 27 13-Dec-1915 E. Des Moines IA Not found 1861 recruit; mustered out 9-5-1864. Houston, Camilus B 18 New Wilmington, Pa. not found No other information available. Howe, John C A 20 Feb 11, 1864 Pittsburgh PA not found death date from ACWRD. Hudson, Orando C 18 9-Feb-1901 Forty Fort, Luzerne Co. PA 72983219 "Ovando"; Per ACWRD March 6, 1865 substitute--mustered out with regiment July 24, 1865. Hughey, Ann's C. D 26 light 5' 11" grey light laborer Allegheny Co. Chartier PA Allegheny, PA Feb 8, 1836 30-Sep-07 McKees Rocks PA not found Per ACWRD, 1864 recruit, wounded 2-27-1864 (place not stated);member of GAR post 153--Thomas Espy, buried in Chartiers Cemetery, first name Annanais, also promoted to Teamster. Humphries, Theo. F 18 fair 5' 6" blue dark farmer Pittsburgh, Pa. June 21, 1846 6-Jul-1912 Not Found Per ACWRD, 1864 recruit, birth info and lived in Allegheny after the war. 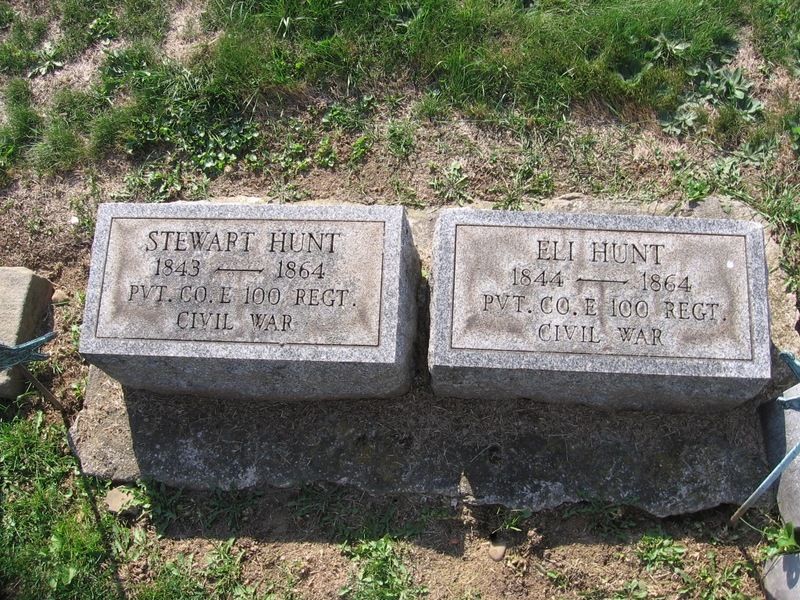 Hunt, Eli E 21 farmer Harlansburg, PA Sept 19, 1864 Weldon Railroad VA X 38434577 died of wounds rec at Weldon Railroad Aug 19, 1864; ball passed through stomach per ACWRD. Hunt, Stewart E 23 light 5' 6 1/2" grey fair farmer Penna. 1843 May 12, 1864 Spottsylvania CH VA X 38434576 killed per Oct. 15, 1884 reunion photo. 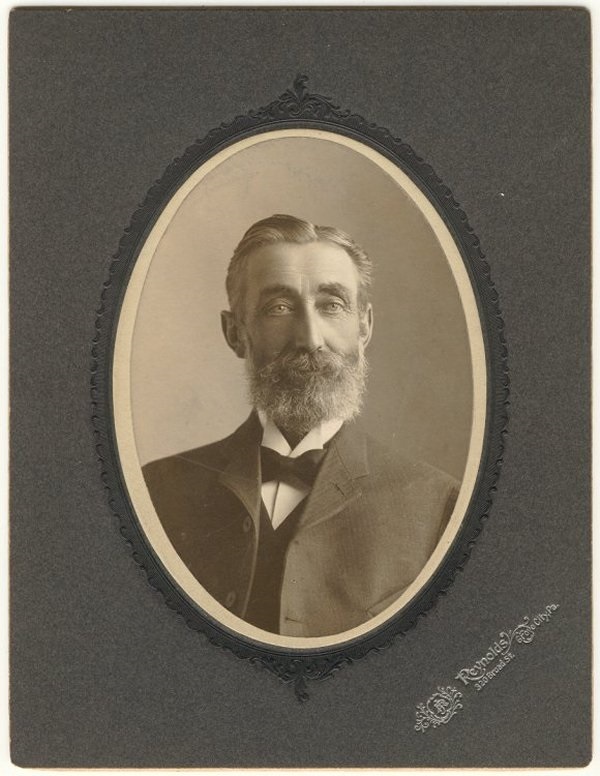 Hurlburt, Hend'n G 18 Nobles Co., Worthington MN 14-Nov-1902 Brandon SD 66512796 Settled in MN then relocated to SD. Hutchison, Cyrus B 17 not found Deserted 7-12-65 from Harrisburg, Pa.
Hutchison, David B. B 18 dark 5" 7 1/2" dark black farmer Lawrence Co., Pa. Pa. Nov 1, 1864 captured not found Died Nov. 21-64 in Rebel Prison. Hutchison, Thomas A 53 not found No other information found in ACWRD.